A hero and his lovely lady riding off into the sunset. A knight in shining armor rides in on his white steed to rescue the lovely princess. Its the stuff of fairy tales and legends! Now YOU can be a part of it. The romance of Horse Riding has never been this accessible. First dates to Proposals, Anniversaries to Wedding Photos and more, we cater for it all! In close association with Romantic Events, we have developed a number of amazing Couple’s Packages. While every couple is unique and therefore deserves a unique package, we start with our base packages as seen below and then add in any extra’s you are wanting. If you don’t see what you are looking for here, fill in the contact us form or drop Amelia a whatsapp on 0814779348 with as much information as you can and we’ll be happy to try make your dreams come true. 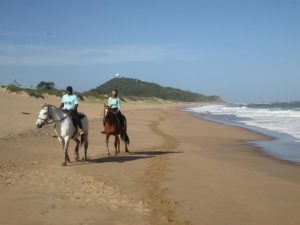 The Sundowner/Champagne Beach Ride – Budget Friendly. Info: This package is fabulous for those awesome summer sunsets that Durban gets. 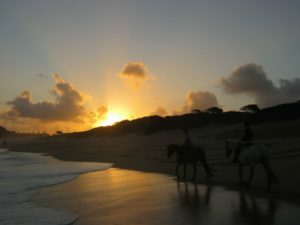 We start the ride in the late afternoon, timing it just right so that you will be at the beach when the sun is setting. Stop for a break to take in the view and enjoy a glass of bubbly (alcohol free) before heading back to the farm in the darkening evening. Cost: R1500 for a couple. The Snacks & Splash with the Horses – For the Adventurous Couple. Info: This is our signature package. Ride to and along the beach. Stop while at the beach, hopping off for a much-needed break. 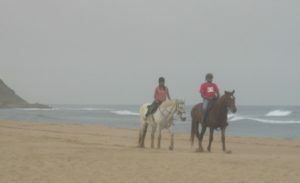 Take the horses to splash in the waves, perhaps even rolling on the sand if the weather is just right. Have some light refreshments (normally chips & juice) before mounting up and heading back to the farm. The Romantic Picnic Beach Ride – For that Touch of Romance. Info: You get to enjoy a fabulous beach & bush ride with the addition of a 45-60 minute break at the beach. When you climb off for your break at the beach, you are given a Picnic Basket filled with delectable foods (Deluxe Picnic Menu) and a blanket to sit on, so you can go pick a spot to enjoy your meal. After which you hop back onto your horses and head back along the trail to the farm. The Beach Ride with a Surprise Picnic – Going all out! Info: Meet us at the beach for a 1 hour Beach Only ride. After your ride, we take you to a specially set up and decorated picnic! 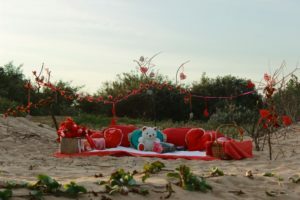 A wicker basket with delectable foods (Deluxe Picnic Menu), a picnic blanket with plush cushions, rose petals, hearts and romantic décor surrounding your picnic oasis. We include a bouquet of flowers for you to keep. Spend about an hour enjoying your luxurious picnic, and then head off to your next amazing activity. Couple’s Photo Shoot – Bringing out the Celebrity in You! Info: This package brings a whole new level of special to you. 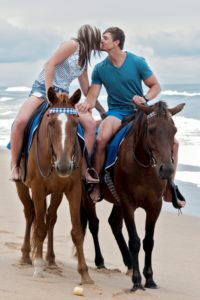 Spend 45 minutes to an hour, wearing beach clothes, evening wear, cowboy outfits, or anything you want to, use some of our props, and of course the horses and the gorgeous backdrop of the sea for a professional photo-shoot (we provide the photographer) that is worthy of the golden globes. The photos are couriered to you (provided it’s a street address in South Africa) about 4 weeks after the shoot.